Wyalusing superintendent Jason Bottiglieri (above, left) relates to the school board and administrators how fourth-grader David Ross rose to the moment on his school bus last month and assisted school staff and his fellow students. 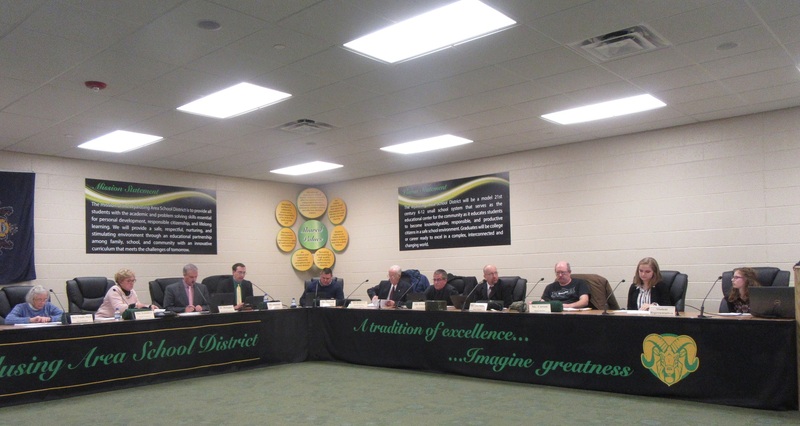 The basic impression from the first meeting of the Wyalusing Area School Board of 2019 is that the majority of programs, initiatives and committee work is right on target for the mid point in the school year. School Board Appreciation month was marked by superintendent Jason Bottiglieri, who thanked the board members with certificates from the Pennsylvania School Board Association and Wyalusing Rams blankets. 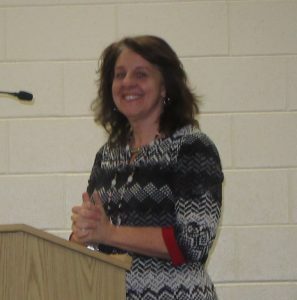 Audits of the district’s finances were approved and deemed “very clean” by Bottiglieri, who also related that a routine inspection by the state Department of Education of the high school’s implementation of the Keystone Exams went very well. Bottiglieri complimented Dr. Deana Patson, who serves as the district’s assessment coordinator. Patson, in turn, credited Guidance Department staff and, in particular guidance counselor Brock Edwards, principal Gary Otis, and assistant principal Donald Jacopetti for ensuring that testing procedures are in line with state guidelines. Bottiglieri delicately referenced a morning in December when school bus driver Jerry Kipp came upon a critical situation to which he was quick to respond in an attempt to mitigate the circumstances. In turn, a number of students were temporarily left unattended on the bus. They had all received training from bus drivers for a variety of scenarios in which their safety might be compromised. “We always wonder if they are listening,” Bottiglieri said of the drills. One of the situations that is rehearsed concerns an incapacitated driver. With no adult on the bus to guide the children, fourth-grader David Ross moved to the front of the bus, got on the radio and began talking to the school to communicate their situation and their location. David humbly accepted a citation for heroism from the superintendent and the heartfelt applause of everyone in attention. Fourth grade science teacher Tammy Card (below) and her students from the 2017-18 school year got a holiday surprise when an episode of “Sick Science” on the Xploration Station on which they were featured was rerun in December. The submitted video from WVES, which featured Card’s students racing balloon cars, firing “squeeze rockets,” and popping vial tops with chemical reactions caught Spangler’s fancy, leading to an Xploration Station crew visiting the school last spring and interviewing Card’s students. The video, which was shown to those in attendance, made the finals of Spangler’s contest along with one from Florida and another from Annville, PA. Though Wyalusing did not finish the contest in first place, Card said that it was a thrilling experience for the youths, and she thanked the board for allowing her to travel to Denver and Alaska to meet and work with Spangler. 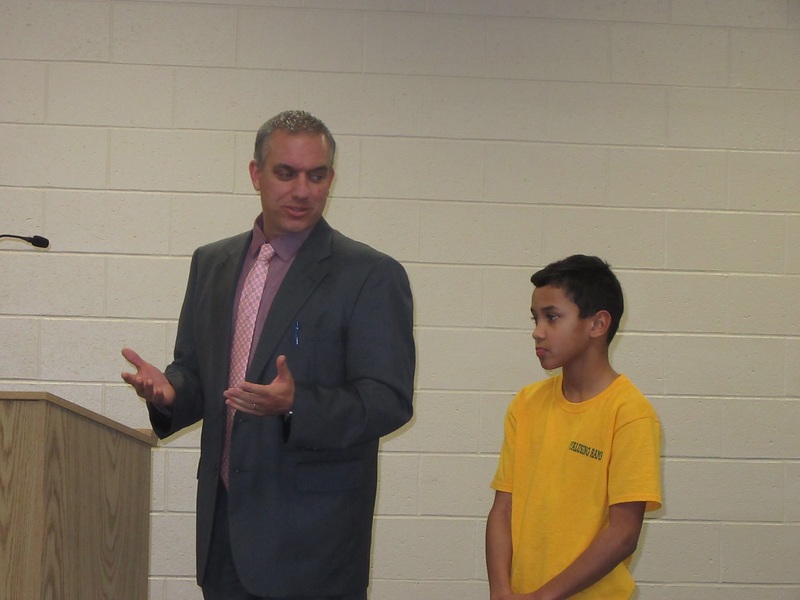 Board president Chad Salsman noted that passage by the board of a resolution that school taxes would not be increased this year beyond what the Department of Education allows is a milestone for the district. Act 1 was established in 2006 to cap the increases that school districts can levy, but expenses hoisted onto school district by the state often outpaced the limit, Salsman explained. “Historically, we have requested exemptions in order to raise the taxes beyond that limit,” he related. The Budget Committee recommended that this year’s tax increase of 3.1 percent be kept within the recommended cap, a motion carried unanimously by the board. “We’ve done enough planning to get ahead of the curve,” said Salsman. As students begin rehearsals for the musical “Newsies,” nearly $20,000 in sound and light upgrades in the Kenneth S. Williams Auditorium will be completed in time for their March 14 to 16 performances. New stage lighting includes LED bulbs that Bottiglieri noted are at least five times more energy efficient than incandescent lighting. An $18,453 enhancement to the sound system includes a new, simplified sound board that almost anybody can plug a microphone into and be heard, as well as measures to eliminate the cutting out of cordless mics. The old sound board will remain in service for more sophisticated programs, board member Richard Robinson noted.